The making and wearing of Szeged slippers are closely connected to the history of Szeged. They were one of the most typical footwear of the citizens of Szeged in the 19th and 20th centuries. Nowadays, they are available only as souvenirs. They have become one of the symbols of Szeged. Szeged slippers became well-known in the country in the first half of the 20th century. The method of preparation and its fashion come from the period of the Turkish occupation. Even today we try to preserve the technique of preparation for later generations. The making and wearing of the slippers became widespread in the country in the 16th and 17th centuries. The slippers made by the masters in Szeged grew very popular in the villages of the southern region and also near Szeged until the second half of the 20th century. After the Great Flood of Szeged in 1879, with the paving of the city, slipper making started to prosper. Earlier, because of the muddy streets, women wore boots. Poorer women preserved the characteristic forms of the Szeged folk costume for 50 more years, by wearing the colorful and decorative slippers. Between the two World Wars wearing the slippers became fashionable even among the intellectuals and officers. Civilian women preferred wearing Hungarian folk costumes, embroidered, handmade products, as the Szeged slippers. The masters satisfied the demand of new customers with a new type, the so called Japanese slippers. The masters of Szeged were successful at several local and national fairs. Szeged slippers, decorated and embroidered with butterfly patterns and flitters, were praised by the press and writers such as István Tömörkény, Ferenc Móra and Zsigmond Móricz. By the middle of the 20th century, thanks to the visitors to the Open Air Festival, to the national industrial exhibitions and fairs, Szeged slippers have become a phenomenon. 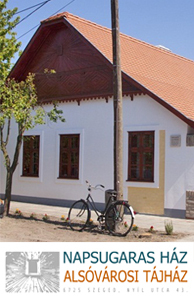 An exhibition opened in Agóra on 6th February – in order to have a place where visitors can see the Szeged slippers even during the reconstruction of the Móra Ferenc Museum. The exhibition is open until 31 August in Szent Györgyi-Albert Agóra.